There are countless restaurants and bars located up in the City of London's many skyscrapers, offering views of the Square Mile from the comfort and warmth of the indoors. Outdoor rooftop season is well and truly gone; forget it ever existed. Winter has put down its icy roots, but that doesn’t mean we have to abandon the option of taking in breathtaking views when eating and drinking out in the City. Rising above the Square Mile are countless luxury dining spots which offer stunning sights – all from the comfort of the great (and warm) indoors. 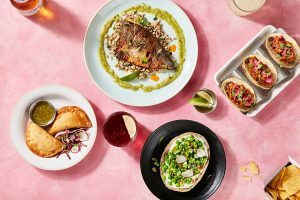 Perch at a bar overlooking the Gherkin and Cheesegrater while sipping on Martinis, or sit down by a floor to ceiling glass window and feast on some insanely good food. Just try not to get vertigo. Take the panoramic glass elevators towards the 39th floor of Heron Tower to find Sushisamba’s massive split-level bar and restaurant. The main dining room overlooks the London cityscape with floor-to-ceiling glass windows, and is home to a blend of Peruvian, Japanese and Brazilian cuisine. 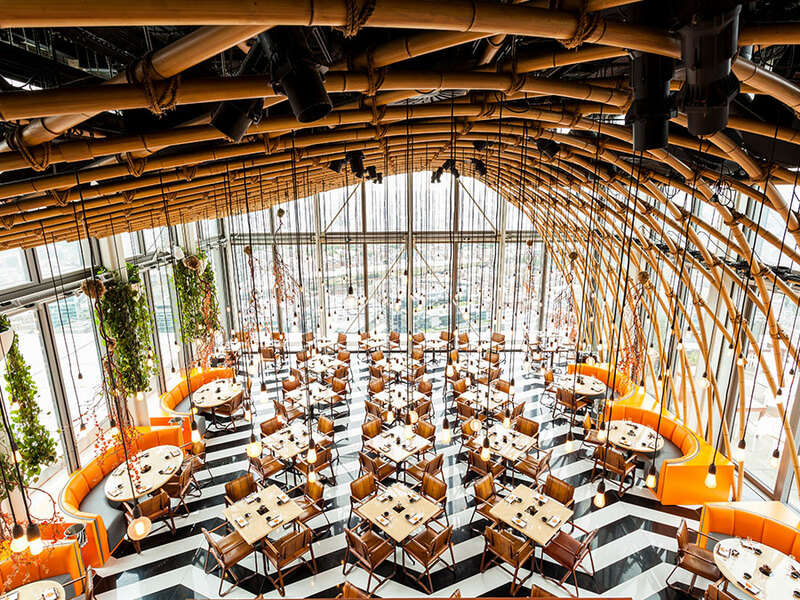 While this part of Sushisamba is glorious, the main focal point of the space would have to be the illuminated orange tree sculpture set within the main bar. And if the weather in London is being kind, they’ll even open up both of their outdoor terraces which are the highest in all of Europe. It is absolutely worth venturing here for a night of proper indulgence. Step out of the lift and into City Social to be immediately greeted by the Square Mile’s famous skyline – you’ve got the Cheesegrater and the Gherkin right there among swathes of imposing towers. And the interiors of this joint aren’t too shabby either. It’s all designed in a glamorous art deco fashion (very Gatsby-esque) with each table and accompanying leather banquettes looking out over the cityscape. Jason Atherton, the executive chef and owner, even managed to secure a Michelin star for the restaurant within the first six months of opening. It’s just about as good as it gets for modern British dining in the City. Views from Madison are truly unique to the City of London. The heated and partially covered outdoor terrace looks right out on St Paul’s Cathedral – made even more impressive when lit up at night. The Manhattan-style restaurant is sleek and luxurious, offering simple grilled meats, burgers, and salads to a City clientele. Evenings and weekends even see bands and DJs liven things up. 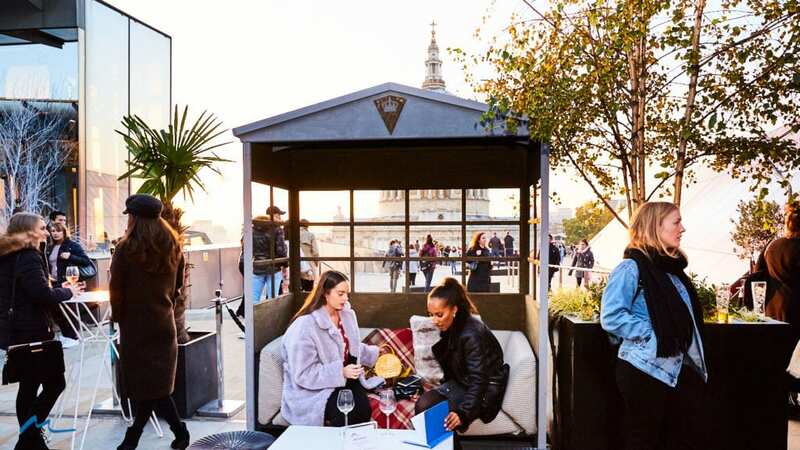 Diners should huddle outside on the huge terrace with a few winter warmers and gawk at St Paul’s while taking the obligatory selfies for Insta – likes guaranteed. The space overlooking the Thames and the City of London is split into two distinct sections; east and west. On the west side lies Oblix’s sophisticated dining room with an open kitchen serving up all manner of deliciousness. 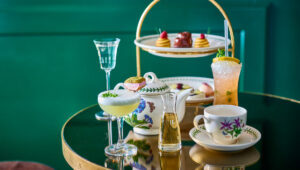 Chefs are best known for their modern a la carte menu, but are definitely worth visiting for a refined Sunday roast and afternoon tea selections. On the east side of Oblix is the main bar where they creative cocktails and extra special bar bites reside. Oblix East is ideal for those chasing views but unable to splash out on a fancy meal. 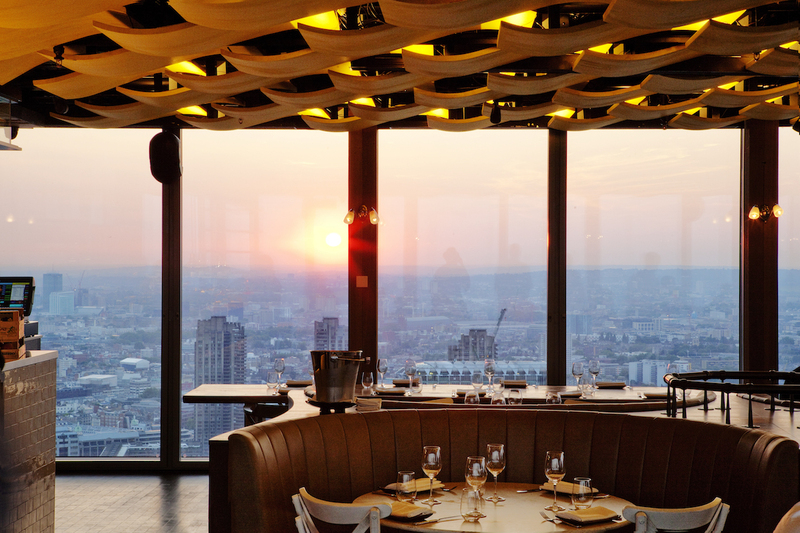 This restaurant and bar, located on the 40th floor of Heron Tower, is open 24 hours a day, seven days a week. They never stop! Duck and Waffle is best known for its signature duck confit served on waffles with a fried duck egg and maple syrup, which is perfect for any time of the day or night. Order it for brunch, lunch, dinner or a midnight snack after a boozy night out. But the bar is also one of the big drawcards, and cocktails are constantly being updated by the pro himself, Rich Woods. He is a master of mixology, making Duck and Waffle’s drinks menu one of the very best in the City. The team behind the St Pancras Brasserie and Champagne Bar run the Gherkin’s most opulent dining spot. The modern British menu hits all the right spots and the drinks menu is right up there with the best of them. It is a minor shame that the views over the City don’t include the Gherkin itself. Nonetheless, you do get to marvel at all the surrounding buildings as you tuck in to top nosh that will leave you feeling like you are on cloud nine. With uninterrupted views over the Southbank, the Sky Garden’s rooftop eatery, Fenchurch Restaurant, is a huge player in the sky-high fine dining scene. They serve modern British and European cuisine to a mixture of tourists and corporate folk. 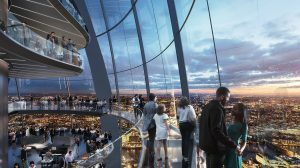 Visitors can even pop to the other eating and drinking spots in the Sky Garden, including the Sky Pod Bar and the Darwin Brasserie, for something a little different.